Carroll Gardens pizza chef Mark Iacono reopened his famous, and beloved, Lucali this week after closing the pizzeria in October for repairs to the walls, floors and wood-burning pizza oven. 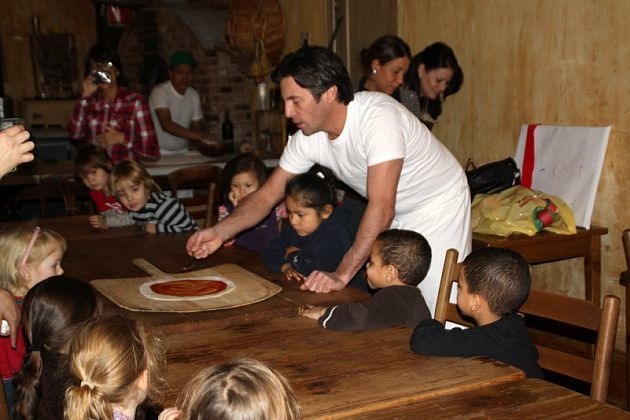 Iacono worked for years as a marble mason and in interior architecture before opening his restaurant — which serves only pizza and calzone, no alcohol, and does not take reservations — back in 2006. He said he did all the recent repairs himself, including re-plastering walls and replacing the oven’s steel lining, after continual 800-degree temperatures burned the metal away. As he did when he originally opened the restaurant, Iacono’s re-opening Tuesday was quiet and casual. “It’s a soft opening,” Iacono told South Brooklyn Post. Iacono never had a grand opening for Lucali, the Henry Street restaurant he built himself in the former candy shop on the Carroll Gardens block where he grew up (his friend Anthony inherited the candy shop from his parents and tired of the endless hours to run the place). Iacono opened Lucali to friends and neighbors and it’s been slammed ever since, thanks in no small part to Iacono’s romantic interior design of the rustic eatery, and his diligent insistence on the best ingredients, including basil imported from Israel, which comes on every pie, an all-beef pepperoni and two types of mozerrella (wet and dry) and Grana Padano imported from Italy. People come from all over the city and internationally to taste the famous pizzas that are just as delicious if not more so than dozens of food writers have proclaimed them to be. If you see Mark, congratulate him. He’s about to open a second location in Miami, replete with a secret door to a wine bar next door. That restaurant is set to open, at 1930 Bay Road in South Beach, in December, and ought to introduce Miami to some seriously good Brooklyn pizza. Iacono said he designed the Miami restaurant to mirror Lucali in Carroll Gardens — it’s just a bit bigger.